To keep my interest while learning Chinese, there has to be a balance between enough repetition that I can tell I’m making progress, but also enough variety that it stays interesting. 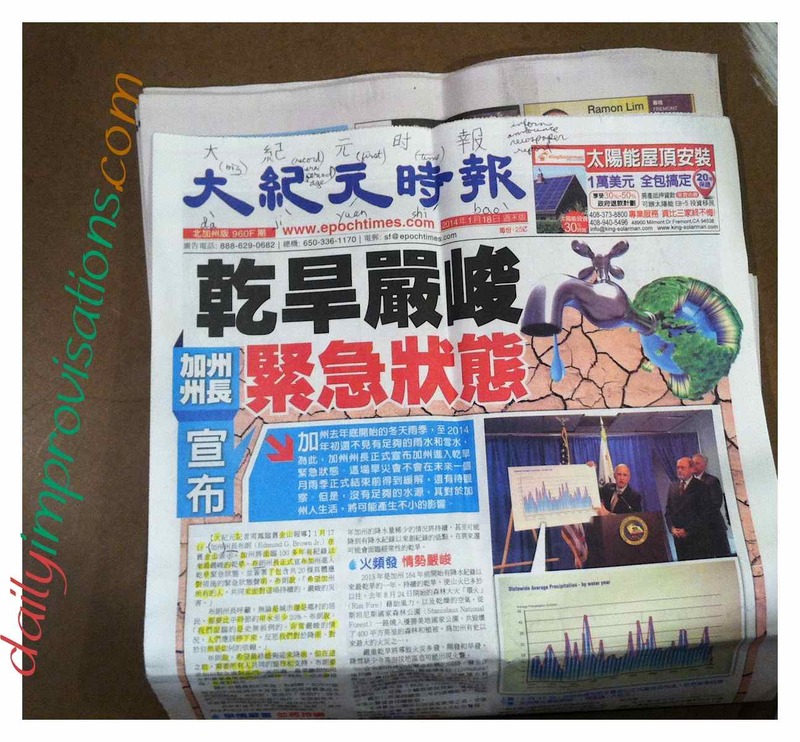 I added variety to my studies last week when I picked up a Chinese language newspaper (link to the article I used) at the San Francisco airport during a layover. The same thing could be accomplished by finding an article online and printing it out. Even though I thought that understanding that level of written communication was way beyond me, I decided to play with it anyway. What happened surprised me! At first glance, it was totally intimidating. I tried visually skimming one front page article for familiar characters, only to find myself lost in the rows of symbols. So, next, I fished out my yellow highlighter and began highlighting any characters that looked reasonably familiar. This was a little tricky, because I have learned to recognize the radical (base characters) that are used to create the huge number of characters. I have also seen some characters more than others. I decided to stick with those that I felt most familiar with, maybe adding another if it seemed “attached” to form a word. I have gotten pretty good at gauging when my brain is on overload and it is time to move on to another aspect of studying, so I only got about ⅕ of the way through. Next, I decided to check and see if I was remembering their meanings correctly. Some of them were extra easy, like those designating the dates. Others I had to use the KTdict Chinese – English app on my iPad. If a character was very complicated to draw, I usually tried typing in what I thought was the pinyin spelling first, to get the list to choose from. When this failed me, I used the finger drawing option and was pleased to see that sooner or later I could draw all characters so that the program recognized them. Either way, one advantage to this was that I often ended up getting a character combo that I recognized in the text, which saved me some search time. I have learned that it is beneficial to my memory if I go ahead and look up the translation of both (or all) characters in a Chinese word (or idiom), as opposed to just remembering the Chinese pronunciation. Otherwise the characters remain too abstract and my brain has nothing to latch onto to recall them. It also increases the likelihood that I will more effectively understand and translate other words (character groupings) with the same character in them. This is not to say that I can recall every character when I have seen it once, but if I have more fully understood it’s meaning, I will remember it from future repetition much more easily. When I started the process with the newspaper, it helped to use the parentheses around or underline characters that went together in words. But after I started to recognize some of the repetition, I dropped this step in favor of not cluttering the paper too much to read or detract from the authenticity of trying to read it. Some of this was helped by the fact that the political propaganda nature of the article was being emphasized by repetition. What was probably meant to reinforce certain conclusions for the readers, was a tool for me in my translation effort. I learned that “government” sounds the same in any language. 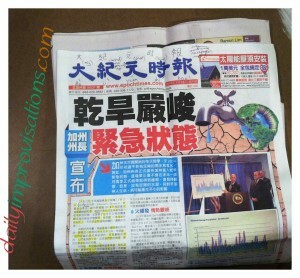 Here is a closer look at the particular Chinese article I was highlighting and translating. It turns out I was reading about California’s supposed water shortage and how the community should pull together and live in deprivation, according the governmental propaganda. Words that have been harder for me to remember in the past, like the names of states or titles of office were repeated so often as to be almost comical. It must have stood out more to me in the foreign language. 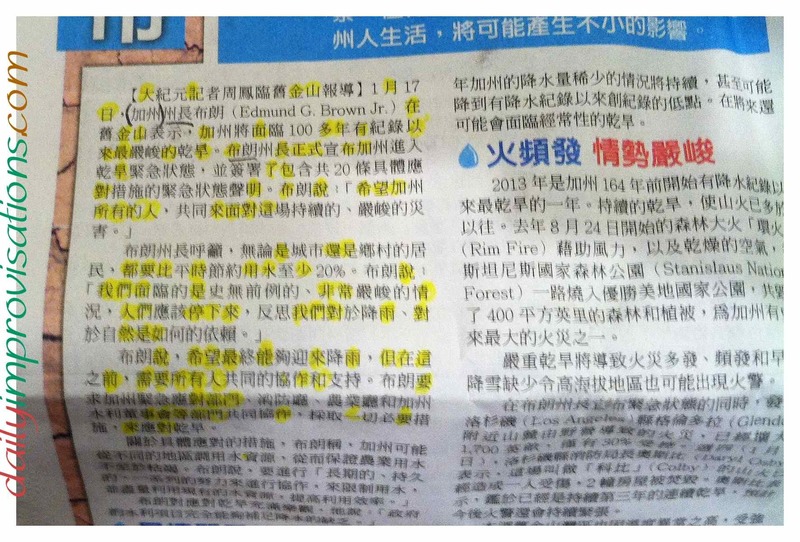 Though I only made it part way through the article, I was particularly interested in translating the name of the newspaper, shown in large characters at the top. I knew this could likely be less straightforward since it was a name. In this case, it didn’t end up that way. 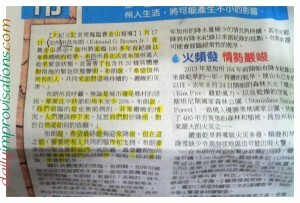 I found that they use 3 characters to create the translation for the word “epoch,” but only 1 character for the words ” times” and “newspaper.” In the spaces around the heading, I had room to write the pinyin and English options for the words, which helped me grasp how the words were being used. Sometimes the Chinese is so exact and simple is what it is saying. “Epoch” is created by the characters meaning “big/great, era/period/age, and first/original/chief”. They do tend to like to repeat meanings with different characters in the same words to make the meanings feel more solid. Learning to recognize names when reading Chinese can be tricky because they make names out of common words. It seems to me that this method of highlighting and looking words up could be useful for any foreign language. It should be easier if the language uses the same alphabet or symbols that a person is used to. I may have to have my Chinese tutor (Vesta Huang, newterra2012@gmail.com – she can give lessons via Skype, too) read the article on a recording now, so that I can listen to it for the repetition and proper sounds. I am also thinking it may be fun to finally try to find my way around a couple of the Chinese fashion magazines I brought home from Taiwan a few years ago. Definitely no lack of materials to play translation games with.